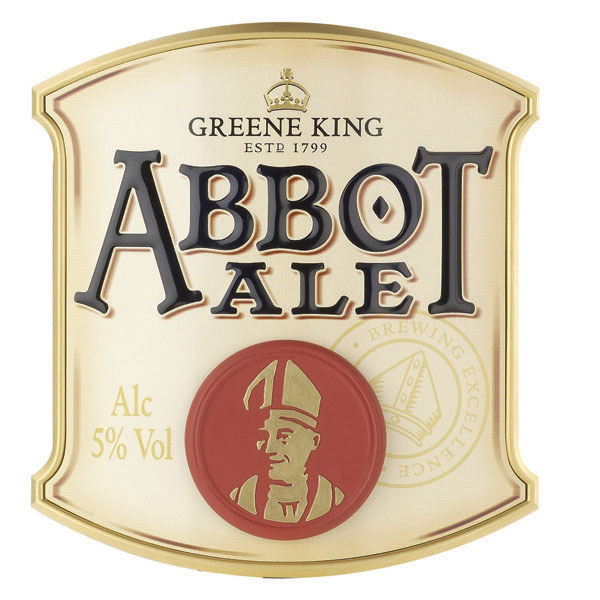 Abbot Ale is Greene King’s flagship beer and is also one of the first real ales that I ever had the pleasure of trying back in the day. As such it is probably a little surprising that it has taken me quite so long to work my way round to writing a review on this particular beer. I guess the biggest reason is that of choice; there are so many other beers out there and I am so keen to try them all (ambitious I know!) that if I am out in the pub I will drink pretty much anything before I consider heading for an Abbot, likewise if I am in an off-license there are literally hundreds of bottles that would come home with me first. First things first let me state that this is a cask pint from the Hamilton Hall at Liverpool Street Station. It is NOT – note the capital letters – from one of these cans with a widget in. I don’t really like most ales in a can and Abbot is no exception. When poured properly, not like my first pint that was slopped into the glass whilst the barmaid was chatting to her friend, you should see a clear golden/amber pint with a decent white head of about 2 fingers width which slowly fades away to a thin layer which stays throughout. You can quite clearly make out the smell of malts, some fruity sweetness and a touch of hops but everything is fairly muted with no one aroma standing out from the crowd. The first flavour that really hits you is a sweet toasted maltiness but before that can start to seem a bit too much you get the hops kicking in, there are some floral notes and a slight Earthiness – some have even said it seems a bit skunky on occasion. After the hops have started to recede a little you get the bitterness of the beer coming through along with a slight hint of citrus/orange as well. The flavours in Abbot ale are all quite crisp, strong and well-defined the only slight issue that I have is that everything is a little bit mish-mash and all over the shop, for example there is a fairly distinct cinder toffee note that you get right towards the end of the beer and because there is nothing around to balance it or cut through it you are left with a slightly burnt after taste. Not unpleasant by any standards but possibly a little disconcerting to some. I have an old friend who always accuses me of being more complementary of Abbot Ale than I should be as a result of it being one of my first real ales. He might have a point but then again sod him, there is something to be said for flavours or smells that take us back to a certain time or place and if Abbot Ale does that for me then so be it! When all is said and done I still have my original problem with Abbot; it is a good beer, there is nothing about it that is unpleasant or even less than pleasing but it isn’t a great beer – I wouldn’t ask for a pint to be bought to me on my death-bed. If you are looking for a good example of an English Ale than Abbot will see you just fine but there are better beers to be had. So we meet again Mr Bland…. Whatever it was called one thing is for certain it is still kicking around today, now under the interesting name “Greene King Hop”. The premise behind beer to dine for was that it would be the perfect accompaniment to food and would help win people over to real beer, particularly women. It looks fairly good, both in the bottle and when poured, having a nice clear honey gold colour with a fairly small head that quickly dissipates to nothing; I can well imagine it being poured into fancy glasses at some dinner party in suburbia and fitting in well amongst the Blossom Hill and Jacob’s Creek. The worry started to set in when I realised that there is no aroma, not just that it is faint but that there is quite literally nothing at all, not good. The worrying lack of anything continues when you take a sip the best thing I can say about GK Hop/Beer to Dine for is that it is bland. There isn’t really anything about it that jumps out and grabs your attention. There is some sweetness there and a slight amount of bitterness but being brutally honest there isn’t really much more flavour then you would find in Carlsberg or any other mass-produced lager. Now correct me if I am wrong but isn’t the whole point of proper beer to steer people away from tasteless crap and onto something with a bit more going for it? Well you will never achieve that goal if the alternative is just as bland and unassuming. The finish isn’t really anything you would be impressed by either it is thin and just helps contribute to the fact that this might as well be a bottle of fizzy syrup that has been allowed to go a bit skunky. 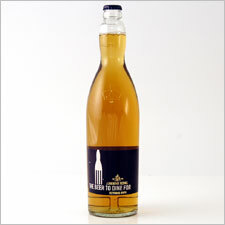 Oh yes did I mention the fact that due to the naff clear glass bottle 4 out of the 7 I tried had a nice skunky essence to them, just what I would want with my coq au vin! I don’t go in for the idea of slagging off Greene King because they keep buying up smaller brewers but at the same time they really should know better than to put their name to this muck. It is marginally better with food but that is only because it is bland and inoffensive and doesn’t detract from what you are eating. So often these days product names come about as the result of million pound research campaigns by marketing executives with perma-tans and expensive hair cuts, this thankfully isn’t the case when it comes to real ale. Quite often there are quaint little tales of why this brewery is called this or why this beer has such a name Old Speckled Hen has one of these little tales all of its own. The beer itself is named after an old MG which was used as a runaround for workers in the MG factory. Over years of service, the car became so covered in flecks of paint it earnt the nickname “Owld Speckled ‘Un”, which Morland changed to “Old Speckled hen” when they brewed a special commemorative beer for the factory’s 50th anniversary in 1979 The name being thought up by one Ian Williams who worked in personnel in the factory at that time. 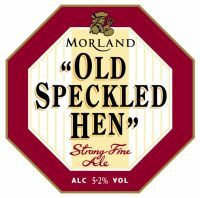 These days Morland is just one part of the huge brewing machine that is Greene King but thankfully the name has stayed the same and so has the beer. Old Speckled Hen used to be 5.2% across both cask and bottled versions but in recent years Greene King have reduced the ABV of the cask version to 4.5% in order to promote it as more of a session beer; this certainly seems to have paid dividends for them as the availability of Old Speckled Hen on draft has increased quite significantly since then. Personally I still prefer the kick of the bottled variant though. There is a fairly good level of aroma to Old Speckled Hen, it has a predominant smell of medicine or cough syrup with a nice hint of malty richness coming in as a background note. The beer pours to a nice bright and clear amber colour that looks very inviting and rich with an off-white head that stay well throughout drinking. There is a lovely sweet malty taste to Old Speckled Hen along with a slightly burnt caramel taste not dissimilar to cinder toffee. Underlying these sweet malty flavours are delicious spicy hints along with a lemony citrus note that helps to balance out the richness and sweetness. The mouthfeel of Old Speckled Hen is most enjoyable, there is a real body and richness that balances perfectly with the dry finish. Whether bottled or cask Old Speckled Hen makes a great session beer but is also rich and robust enough to hold its own alongside food.